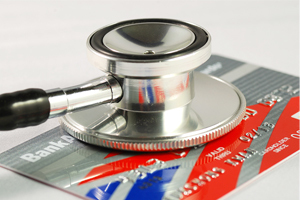 People with credit card or medical debt were more likely to put off needed medical care within the past 12 months. Having student loans, housing loans or car loans were not associated with forgoing health care. People with outstanding credit card or medical debt were more likely to delay or avoid medical or dental care, finds a new study in the Journal of Health and Social Behavior. Other debts, such as having student loans, housing loans or car loans were not associated with forgoing care. Study author Lucie Kalousova, a Ph.D. candidate in the department of sociology at the University of Michigan speculated that some debts usually thought of as “good” debts, such as student loans, have traditionally been a signal of creditworthiness, and probably do not influence decisions to consume needed medical care. For the study, the researchers interviewed 914 state residents about their debt, including credit card balances, home loans, medical debt and student loans, and asked whether they had foregone medical or dental care because of their debt in the past 12 months. Survey results found that most participants carried some form of debt and that having credit card debt and medical debt was associated with forgoing medical care. Those forgoing care were much more likely to have medical debt than those not forgoing care (58 vs. 20 percent) and had more of it ($8,889 vs. $2,783). Respondents who put off needed health care also had lower net worth and lower household income and were more likely to be uninsured than those who did not. David Auerbach, Ph.D., a health economist at RAND Corporation suggests that there are signs that people in these situations may soon see improvement. The Journal of Health and Social Behavior is a quarterly, peer-reviewed journal of the American Sociological Association. Contact Daniel Fowler, Media Relations and Public Affairs Officer, at (202) 527-7885 or fowler@asanet.org for a copy of the full study. Kalousova L, Burgard S. Debt and foregone medical care. Journal of Health and Social Behavior. In Press, 2013. How Much Will Your Health Care Cost?